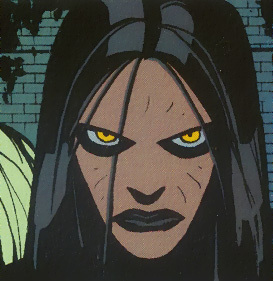 Powers/Abilities: Angel Dust has the ability to increase her adrenalin, gaining superhuman strength (800 lbs. to 25 tons), speed, agility, durability and endurance for a short time. When she uses her powers dark lines appear in her face. Height: 5' 5" Weight: 126 lbs. History: (Morlocks#1-BTS)- Christine, the girl known as Angel Dust lived happily with her parents until her mutant powers kicked in. Terrified of what they might think, and the danger she might place them in, she ran away from home, eventually finding her way to the Postman and his Morlocks. Her parents launched a campaign to find their daughter, but failed. (Morlocks#1)- Angel Dust joined the other Morlocks in defending the mutant Cell from the police. "Why don't you just leave us alone? I...I didn't do anything wrong!" she asked a police officer, before decking him. When Cell panicked and wanted to return to the surface, she explained to him about the Sentinels. (Morlocks#2)- Angel Dust confronted Electric Eve, calling her "cold" and Eve retorted that she was stupid for running away from home, and like it or not, the sewers were now her home. The argument became more heated, until Shatter and Cell stepped in to break them up. Angel flung them both back, splattering Cell against a post and knocking Shatter onto the subway tracks. As Shatter got up, his hood fell back, exposing a huge crater in the side of his skull. Angel, thinking she'd caused the injury, fled in tears. Shatter tracked her down and explained that she wasn't responsible; he'd done it himself in a suicide attempt. The two then talked about how much they hated life in hiding. Angel accompanied the Morlocks as they rescued Shatter's dog, Hank, from the pound, then followed as they went to make Eve's "wish" come true, unaware that wish was murder. They arrived to find Eve having fried her ex-pimp. As Eve and Postman argued, the Sentinels arrived, blasting Shatter's arm off. 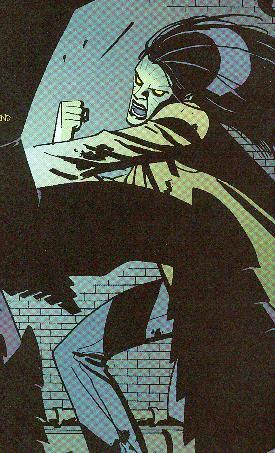 (Morlocks#3)- The Morlocks fled back to their subway station home, and Angel helped Postman care for the wounded Shatter. She asked Cell what his wish was, and Cell replied he had none; he just wanted to earn his keep. As Postman and Eve began to argue again, the police arrived, killing Trader as he tried to protect Eve. As the others fought, Angel tried to shield Shatter, trying to protect him, and begged the police not to hurt him. They apparently had worse plans for her, "Could have some fun with this little mutant.” one of them stated, but Eve leapt to her defense and fried the cops. Angel was shocked as the enraged Postman erased the surviving police officer's minds. They then left to make Postman's wish come true. Angel and Litterbug tore down a steel hospital door so that he could see his comatose wife one last time. Postman then led them to the sewer junction beneath Washington and Chestnut, where Angel's parents lived, remarking that it was on his route. Angel was afraid to face them, fearing rejection, but Shatter explained that they all deserved closure. Angel went to her home and found her worried parents surrounded by Missing posters. Angel explained that she was a mutant, but they didn't care, she was her daughter, and they loved her. With her time up and the Sentinels homing in, Angel was forced to flee to protect them. Eve comforted her as she cried, wishing their was some way that they could live free of the Sentinels. Litterbug explained that their was a way, to disable the Sentinel Central Control. He then admitted he'd helped design them. (Morlocks#4)- Enraged, Angel attacked Litterbug, pounding him down until Shatter convinced her to stop, that they all needed to work together. The Morlocks lured out and "captured" a Sentinel. Angel ripped it open, and then reprogrammed it following instructions from Litterbug. They sent a false message to Sentinel HQ stating that they'd been killed, and then used the giant robot as a Trojan Horse to get inside the control center. After the Morlocks ripped their way out, Angel tried to re-program the computers, but had to save Cell from a guided missile. Electric Eve and Litterbug destroyed the main computer, sending the Sentinels out of control, and they Morlocks fled, but Cell ran back in, determined not to let the Project Director, Dr. Metellus, have another chance to harm his friends. Angel tried to convince him to run, but Cell was killed along with the doctor. As the others hot-wired a stolen van, Angel decided to stay, like Cell, she was tired of running, and just wanted to go home to her parents. As the others left, Shatter asked what would happen to Angel when the Sentinels got back on line. No one answered. (New Avengers#16-19 - BTS) - She lost her powers on M-Day and the energies removed from her were combined with a number of other mutant energies to empower the powerful being Michael. Comments: Created by Geoff Johns and Shawn Martinborough. It's possible Angel and her parents could have left town for somewhere safe together, they'd have been fools to stay and wait for the Sentinels to be re-built, and come back and kill them. Eve called Angel an "All-American Cheerleader", but it's unknown if she really was a cheerleader, or if Eve was just being sarcastic about her squeaky-clean nature. Angel Dust's mother and father were distraught after she ran away, and diligently searched for their daughter, as seen by the missing posters in their home. 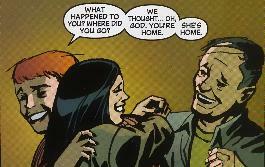 When she returned they were overjoyed, not caring that she was a mutant. Unfortunately, Angel had to leave quickly, to avoid the Sentinels endangering her and her parents. After the Sentinels were destroyed, Angel returned home to her parents, to enjoy the temporary reprieve. All other characters mentioned or pictured are ™� and © 1941-2099 Marvel Characters, Inc. All Rights Reserved. If you like this stuff, you should check out the real thing!